Mumbai, April 2: Actress Hazel Keech underwent surgery to fix her nose as she was struggling to breathe. She has thanked her mother-in-law for taking her to a hospital and getting a "new nose" to let her breathe "happily". The once active social media user is back on Instagram after almost a month's break. 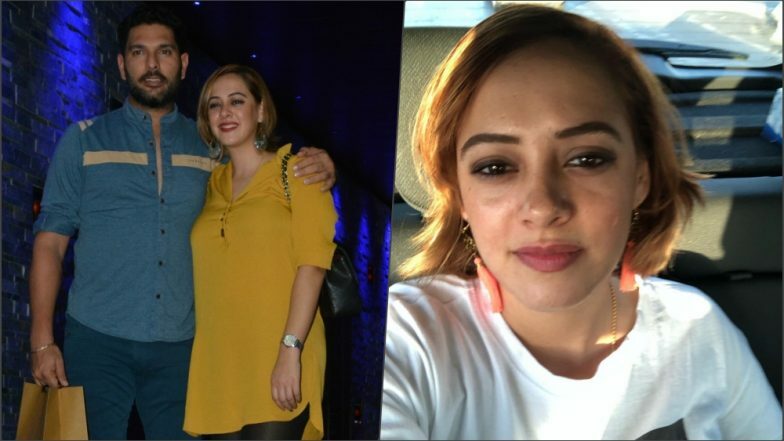 Hazel Keech’s Birthday Was All About Fun and Laughter; See the Pics Yuvraj Singh Shared on Insta. Hazel shared a new post on the image sharing site: "I've not posted in a while so I thought I would fill you in on where I've been hiding (those of you who were wondering)." She adds, "A month ago, I had a surgery to fix my nose - for as long as I can remember I've struggled to breathe through my nose, although not a serious health issue, a chronic one that I just learnt to live with..."
"Lucky enough for me, it annoyed my mother-in-law so much that she finally took me to a hospital, because of which we came to know just how much internal damage there was and understood the problem. So thanks to her I have a new nose (internally) and for the first time in my life, I can now breathe freely and easily." Hazel, who is married to cricketer Yuvraj Singh, also shared that due to the surgery, she has not been active or able to exercise yet. "So I've put on some weight hence, staying away from social media." "But f*** it, here I am, better than ever, breathing happily, all thanks to my mother-in-law who's receiving blessings from me everyday because finally, finally, I can breathe," she shared along with a close-up photograph and another with Yuvraj's mother.